To satisfy my baking craves, I was contemplating whether to bring some of my baking tools along to Beijing when I was packing for the trip. In the end, there was simply no space left to stuff in that tiny diet scale (yes I use it for all my baking) not to mention the electric hand held beater or even a balloon whisk. The service apartment that we are staying comes with a handsome built-in oven, it makes my tiny tabletop oven at home seems so miserable. It would really be a shame if I am not able to do some baking with my dream oven. To my delight, I chanced upon boxes of Betty Crockers at this little gourmet store near our apartment. 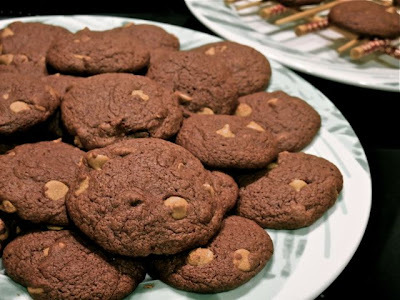 Without much thinking, I grabbed a pack of chocolate peanut butter chips cookie mix. It was only after I got home that I realised there is no measuring cup in the apartment's kitchen. Since I have no intention to go hunt for a measuring cup, I had to think of a way to measure the amount of oil required to make the cookies. To stir up a batch of cookies from a box is so simple, quick, and very convenient especially when there are no basic baking tools on hand. I only need to mix some water, oil and an egg with the powder mix, and in a matter of minutes, I was able to pop a tray of cookie doughs into the oven. While the cookies were baking in the oven, I suddenly remembered that there was no cooling rack in the apartment. At that point in time, to end up with a tray of soggy cookies would be unthinkable. After some quick thinking, I came up with my improvised cooking rack...a set of chopsticks which I brought along came in handy! 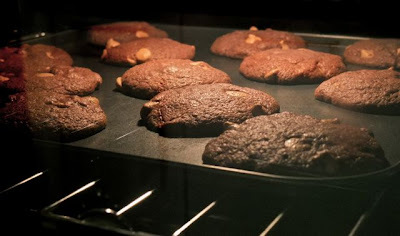 While the cookies were cooling off, the boys couldn't resist the sweet aroma, so they kept 'wondering' into the small kitchen, hoping to steal a cookie from my 'cooling rack'. 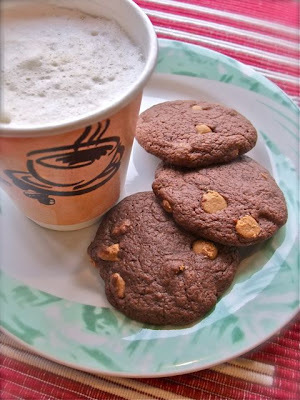 For the rest of the week, I was able to enjoy my afternoon cup of coffee with some homemade cookies. They are not as bad as I thought. In fact, I didn't expect them to taste so good...crunchy on the outside and a little soft in the inside, way better than those I had tasted at some cafes. These are just a little on the sweet side, but once I dunk it into my cup of latte, the sweetness was just right. Till we get back home, I must say I am very satisfied with these homemade cookies, from a box. Love they way you improvise! So creative and well thought! And thanks for sharing with us even on your vacation! Lucky you, you can have a lovely long vacation in your own apartment. WOW! What can I say?! You are SUPER! Ya, I know when the hands start itchy, you could do anything which seems like impossible haha :) Well done super women! You are just incredible, in this kind of situation, you are able to bake, salute you !!! Have you tried the Betty Crockers Brownies? They are also v good n easy to bake. I am going to bake your honey buns recipe this week cos u said its a good recipe, right? Superb! When we are itching to bake, we can think of all ways and I must say you are one great mom! It's great! Cooking is the only thing that makes me feel home...so now your temporary accomodation it's home! When I stayed in California last year (for 25 days) I didn't have an oven :( and baking was the most missed thing of home! HHB!! This post made me laugh! First, I can already relate myself to your itch to bake. Second, at the moment I saw your wooden "handcrafted cooling rack," I couldn't stop but laugh!! I did exactly the same during my last one month in the States when all my bakeware & cookware had been shipped home. 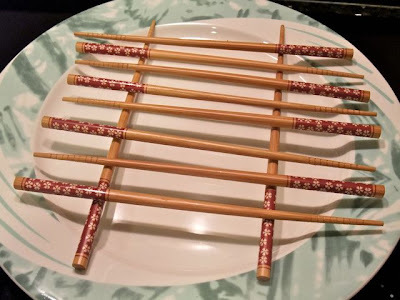 Because the American family friends I was staying with at that time refuse to use cooling racks, I had no choice but to make myself one with the chopsticks available. (Yea, they do have chopsticks. Thanks to us international students, LOL!) Oh, well! I guess we baking addicts share so many things in common! So ,you can bake in any corner of the world now with an oven ! your wooden rack are so amazing!!!!!! very smart thinking indeed! You're so creative! The cookies look lovely! Haha.. I couldn't have thought of that! It looks great :) I guess when there's a will, there's certainly a way. I'm very impressed! 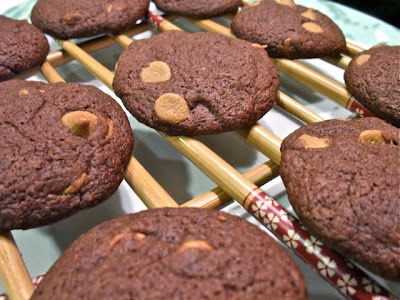 That's one great way to cool the cookies!! I used to be your silence blog reader but this time I must put my tots down. You're too cool! Haha... What can I say?!! when the addiction is knocking at you, you would think of ways to get what you want! Well done! Hi HHB, May i add your blog to my frequent visit link? Hi May, yes, I have tried Betty Crockers Brownies, they are really good! Hi Kim, I am staying at a corporate service apartment, as such I do not know the rate that is being offered, but the rack rate is about S$200 a night for a 1-room apartment. I will recommend staying at places which are more accessible to the major attractions, or where there's a subway station which is within walking distance. You can always take a cab here, but sometimes due to the heavy traffic I find taking the subway (similar to our MRT) much faster. The nearest station from our apartment is at least 15-20mins walk away. It is not so convenient but is a good neighbourhood though, more for extended stay but I won't recommend it if you are planning for a short visit and doing alot of sightseeing. Hi hhb, I miss ur baking posts! That's pretty reasonable.. I'm quite particular about hotels especially China - must make sure its at least 5 stars. Ok nvm, I'll search for an alternatives. Wow, so cuuute! What a great idea. Love the chopstick cooling rack too.